Oh how I miss that, it's a good thing I just got off the phone with her :). We talked for a little less than an hour, it's been about a week since I've spoken with her and coming from talking with her almost every day when I'm at school we had a lot to discuss, lol. 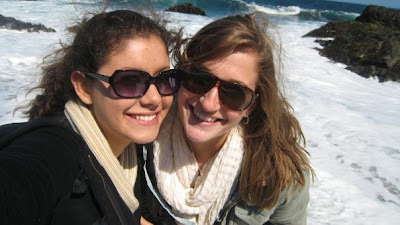 I love being so close to her, I cannot wait for my parents to visit in 2 months! Sorry for being M.I.A. all weekend! Like I mentioned... and you will soon see, I've been quite busy! Friday morning I woke up at 5:30 to get in my schedule run before my days of seminar classes. Since it was a bit earlier than usual the sun didn't start to rise until the very end, but if you look closely you can kind of see the path I take, haha, try squinting, I run towards the mountains on my way back. Friday's breakfast was a toasted PBBJ &Flax Breakfast Sammie with some green tea. I had just come back from my run and was beyond starving so hot oatmeal wasn't going to cut it! Speaking of, it was obvious this morning that I should have ate something before running but I wasn't feeling it. Do any morning exercisers out there have suggestions for pre-run snacks? 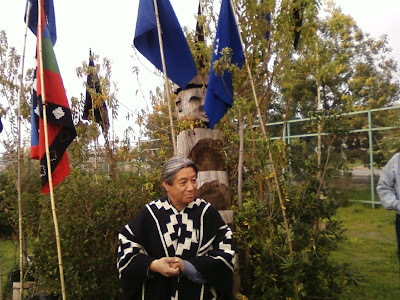 After a long morning class of the different Chilean musical movements we went to a Mapuche settlement south of Santiago. They are the most prominent indigenous group in Chile and have such a rich culture; I had such a fascinating afternoon becoming familiar with it! Not to mention, deeelicious! 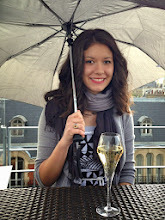 Our first cultural lesson was a typical lunch, you should've seen how happy I was :). 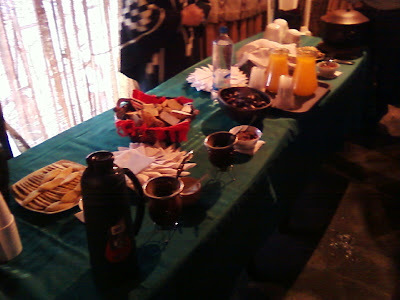 I took the picture on my phone since I left the camera on the bus (oops) so here's the blurry spread starting from the right: Sopa de Porotos (bean soup), Sopapillas (fried flatbread,) Pebre, juice, cooked Piñon (giant pine nuts; incredibly tasty,) and finally, slowly baked bread. 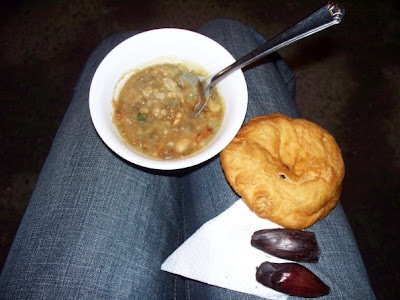 *Edited to Add: My friend, Tim, took a picture of his meal choices and was generous enough to share it with us, a bowl of the lovely Sopa de Porotos, one Sopapilla, and two Piñones. Yum, great choices! Also, just as a precaution, he wanted to make sure you knew that "my legs don't come with the delicious meal (delicious as my legs may be.)" I'm glad we've got that cleared up, might of been awkward. I basically tried everything and was simply blown away at how flavorful yet simple all the dishes were. After, I had just enough room for dessert, a spoonful of homemade raspberry preserves on bread made from the piñones. My lucky taste buds had a field day! That night was unseasonably cold and paired with my exhaustion from my busy day I could not have imagined a better meal, Sopa de Verduras. Hm, let's see if I can recall the ingredients, there was spinach, potatoes, zucchini, corn, green beans, potatoes and rice. I'm pretty sure I hit my varied veggie count for the day, wouldn't you agree? But just in case I had some radiccio and cauliflower on the side ;). That night I think I slept one of the heaviest sleeps I had in a while before waking up to a similar jam-packed day all over again, beginning with a run, of course! Next I met up with the group to take a bus to the coast. 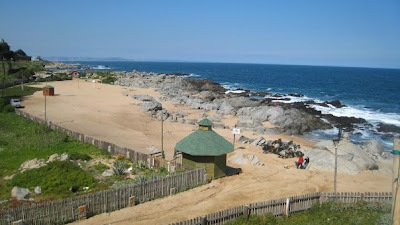 First we went to Isla Negra, literally black island, although it's not an island at all, haha. We took a tour of one of Pablo Neruda's magnificent homes. They didn't allow any photography but, oh my gosh, it was designed to mimic the inside of a ship and with the most incredible views of the ocean, absolutely gorgeous! 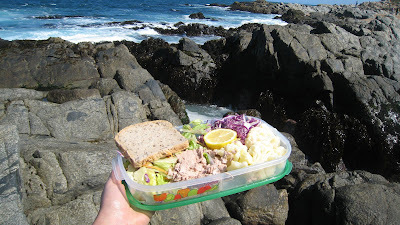 After gawking we couldn't imagine eating lunch anywhere else but the beach... so we climbed onto the rocks below and enjoyed the sight of the Pacific, sounds of the crashing waves, and warmth of the shining sun! 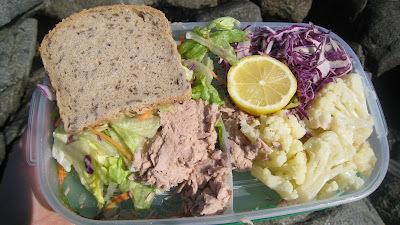 I had a salad mix of lettuce, carrots, cauliflower, and radicchio in lemon juice with tuna and a slice of flax seed-grain bread. 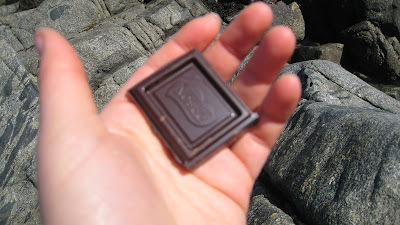 Followed by the obligatory square of dark chocolate. My friend Emily and I couldn't have been more contenta. Afterwards we drove over to Valparaiso, a major port down the coast. 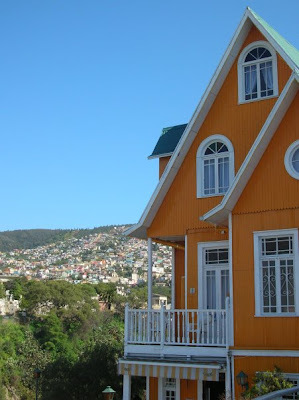 The city is strategically built into the hills and has a ton of colorful houses that had been restored to their antique beauty, I just loved it. 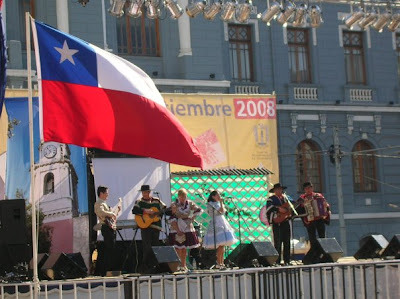 Plus there was festival in the town's main plaza to celebrate Chile's month of Independence. Beneath the stage about 20 couples danced the Cueca, the national dance. Yet another pretty sight for a tourist :). 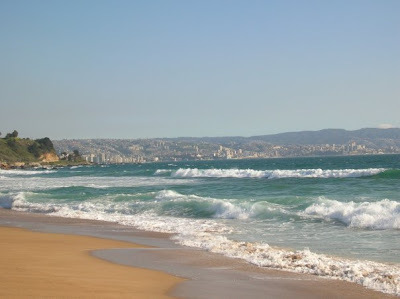 And finally, the beach of Viña del Mar. It was too cold for swimming but, I swear, once the weather gets the memo that spring, and then summer, is on its way, I am spending every waking moment I can here! This city is about 15 minutes from "Valpo," about an hour and a half from Santiago, and the views did nothing short of take my breath away. Almost there! Breakfast this morning was the last piece of that fresh, doughy, english-muffin type bread that my host-mom loves from the bakery. Today I topped it with peanut butter, flax, and sliced apple. I'm trying to limit this scrumptious bread to twice a week since it's probably super low in fiber and doesn't contain tons of nutrients as a result of being made from white flour, any thoughts or opinions on this? And we made it to today's lunch... okay, okay, not quite. 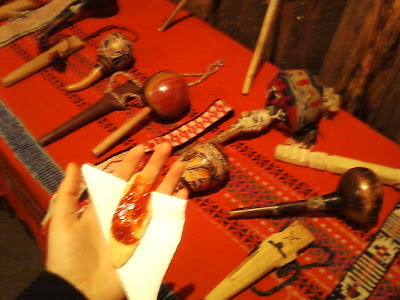 I did have an Empañada de Piño, this just isn't the photo from today, I forgot :(. I promise they looked similar to the last time I had them though! Another yummy mix of beef, onions, raisins, ají, and a black olive baked in dough and paired with (just picture it) a salad of lettuce and tomatoes from our neighbor's garden. As a usual vegetarian, I generally avoid eating meat, but I just can't myself when it comes to Sunday's classic Chilean empanadas. I've said before that I'm not going to let my usual dietary restrictions hold me back from tasting the culture, so I'm hoping I don't offend anyone by my much enjoyed, and dare I say it, worth it, lunch choice. 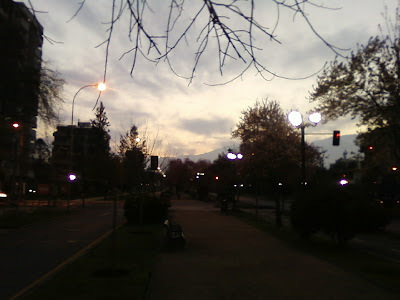 As for now, I have to, get back to mí tarea and, probably more importantly, give you a break from reading my marathon weekend update (thank you by the way, I'm sorry for another long one) Hope everyone has a fantastic week up ahead, I promise to be back soon!